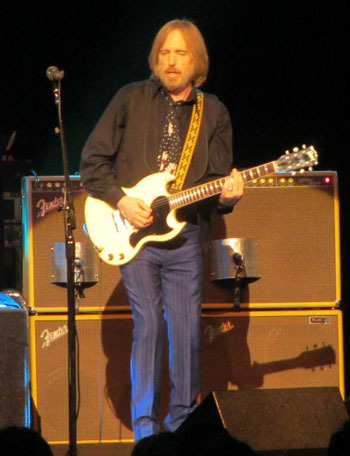 Tom Petty has always been something of an Anglophile: the Heartbreakers actually made their first breakthrough in England during the punk era while still establishing themselves back home; and he speaks highly of how the British invasion of bands inspired him. So it is surprising and disappointing that they had not toured since 1999. But, booked for the 2012 Isle of Wight Festival, they squeezed in a couple of shows at the Royal Albert Hall, which, considering the band could easily have sold out a venue two or three times bigger, unsurprisingly sold out within moments. Support came from Jonathan Wilson whose album had been described in the press as channelling the spirits of the likes of Crosby Stills and Nash and Jackson Browne. Catching the majority of his set, he was rockier than I expected with his band going into a number of free form, but melodic instrumental breaks with twin guitars and some Hammond organ, reminiscent of the brothers Allman and Doobie. 'Gentle Spirit' showed his more laid back side, and the final song 'Silver Moon' also convinced. The long-haired Californian needs to work on his diffident stage presence however. 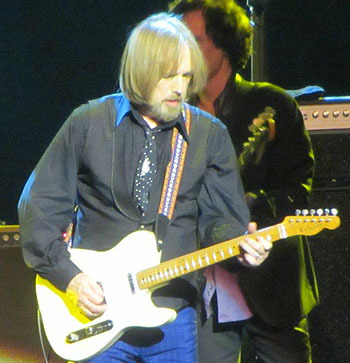 With a Tom Petty and the Heartbreakers show, the music is left to speak for itself: they came on stage in a very low key fashion, the light show was simple, and the show was devoid of spectacle or gimmick. However they deliver one of the classic American rock songbooks with a tasteful and almost effortless understanding, topped off by Tom's characteristic laconic, slightly nasal drawl. After a rather studied, polite start with 'Listen to Your Heart', 'You Wrecked Me' and 'I Won't Back Down', their ensemble playing began to come to the fore during 'Here Comes My Girl', while an early surprise was the Travelling Wilbury's 'Handle With Care', with auxiliary musician Scott Thurston making a fine fist at the impossible task of emulating Roy Orbison's high parts. 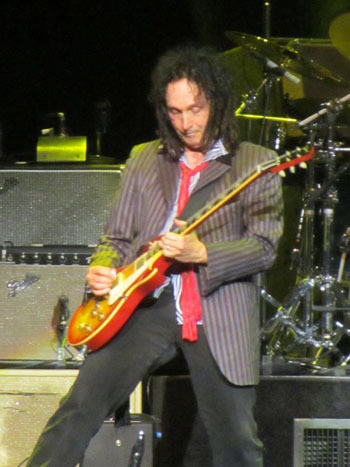 The biggest change in their live sound compared to record is the additional scope afforded Mike Campbell to stretch out and demonstrate that he is more than just a tidy, melodic guitarist but a true axe hero. The bluesy 'Good Enough' from the last album Mojo and a supercharged cover of Fleetwood Mac's 'Oh Well' were the first tangible proof of this. 'Don't Come Around Here No More' had an epic feel, with Tom and Scott sharing the vocals and gradually building in pace before Mike stretched out with an extended solo. 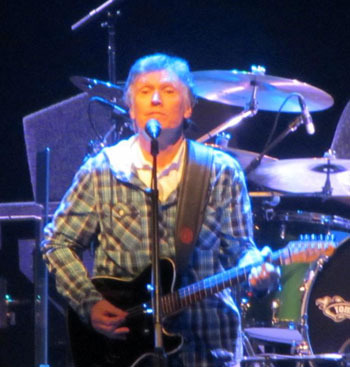 When Tom paid tribute to the British acts that inspired him, there was the added bonus of the ageless Steve Winwood making a guest appearance. The combination of that soulful voice on classics 'Can't Find My Way Home' and 'Gimme Some Lovin', where he and Benmont Tench played keyboards together, and the most deluxe backing band available, made his ten minute guest slot more entertaining than the whole of his headline show I saw at The Roundhouse. 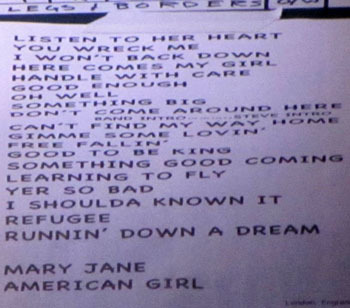 The set list for me was a perfect blend of all ages of the Petty career; I did hear a complaint there was too much from the post Wilburys Jeff Lynne albums at the expense of earlier material, but that was when his popularity peaked here and the likes of 'Free Fallin', which finally got a subdued crowd singing along, and 'Learning To Fly' got perhaps the best receptions of the night. There was the odd cut though for diehards, including 'Something Big' and 'It's Good To Be King', which started as a gentle number before becoming an incredible extended guitar duel between Tom and Mike. Left surprisingly late in the set, Mojo's 'I Should Have Known It' reminded me of Black Dog and for a moment Mike might have been Jimmy Page before the classic 'Refugee', introduced by Benmont Tech's trademark keyboards, and 'Runnin Down A Dream' finally getting most of the crowd to stand up, as the band stretched out, with Mike playing a searing solo. The first encore was another treat with some brilliant combination play during 'Mary Jane's Last Dance', with Scott on harmonica and more guitar workouts from Tom and Mike, before the inevitable set closer of 'American Girl', which was over all too soon though not before a crisp solo from Mike, my man of the match. The Royal Albert Hall does not lend itself easily to a rocking atmosphere, which was a slight frustration, but this was still a richly enjoyable 2 hour 10 minute masterclass form one of the classic American bands. Hopefully it will inspire them to resume their once regular visits to these shores.